Intended for scholars in the fields of political theory, and the history of political thought, this two-volume examines David Hume's Political Thought (1711-1776) and that of his contemporaries, including Smith, Blackstone, Burke and Robertson. This book is unified by its temporal focus on the middle and later decades of the eighteenth century and hence on what is usually taken to be the core period of the Enlightenment, a somewhat problematic term. Covering topics such as property, contract and resistance theory, religious establishments, the law of nations, the balance of power, demography, and the role of unintended consequences in social life, Frederick G. Whelan convincingly conveys the diversity--and creativity--of the intellectual engagements of even a limited set of Enlightenment thinkers in contrast to dismissive attitudes, in some quarters, toward the Enlightenment and its supposed unitary project. 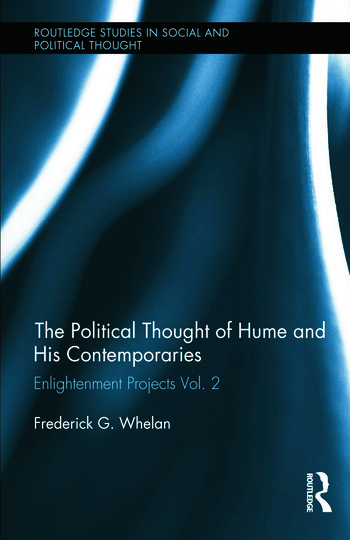 Political Thought of Hume and his Contemporaries: Enlightenment Projects Vol. 2 contains six in-depth studies of eighteenth-century political thought, including both normative issues and examples of Enlightenment social science, including international relations and law, the problem of double standards, political economy, demography, and the causes of imperial decline. The central figure is David Hume, with substantial attention to William Robertson, Adam Smith, Montesquieu, Malthus, and others. Frederick G. Whelan is Professor of Political Science and Associate Dean for Undergraduate Studies at the University of Pittsburgh. He is a leading scholar of Enlightenment political thought.